Deciding to adopt a ferret is a huge commitment, so make sure you are up for the challenge. 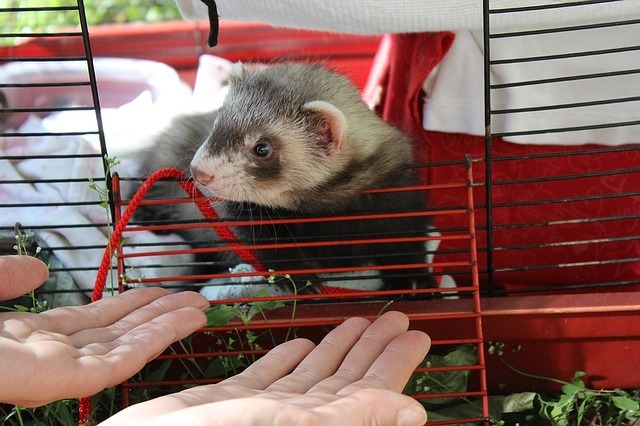 If you still have doubts on how to properly look after your pet, just make sure to own the right indoor cages for ferrets and read these following useful tips. Ferrets need a lot of space to run and exercise, so keeping them inside a cage all the time won’t make them happy. However, they do need a place to nap, rest, and eat, therefore a cage is mandatory. Unlike other small animals, ferrets require more space, so we suggest opting for multi-level cages with plenty of shelves and shelters for your pet to explore. Wire cages are the best option when it comes to ferrets as they allow you to hang various platforms and shelves. And, since these mischievous little creatures enjoy chewing, cages made of wood or plastic are out of the question in the long term. The cage should also include a litter box that should be filled with aspen shavings and comfortable bedding. Ferrets love snuggling, so an old blanket, towel or shirt are perfect for keeping your pet warm. Ferrets love sleeping and taking naps, and this activity usually lasts 16-17 hours a day. Therefore, make sure you store the cage in a cool and dry place, away from direct sunlight. Temperatures inside the room shouldn’t exceed 80 degrees Fahrenheit as ferrets can easily hyperventilate. Whenever they’re awake, ferrets enjoy running, burrowing, and playing around the house, so you’ll have to let them out of their cages and satisfy their curious nature. Ferrets are very loving and demand all their owners’ attention so, if you’re sure they don’t misbehave, you can even cuddle with them in bed – they will love it. 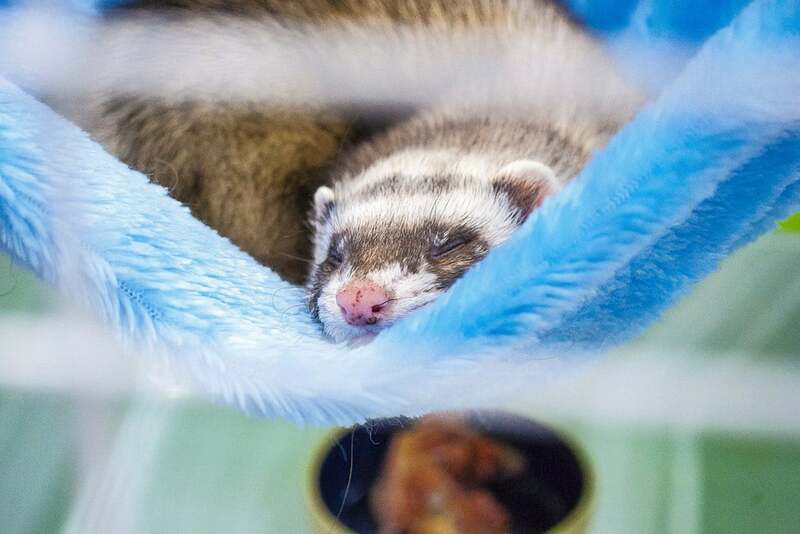 Although spending some time inside a cage could prove beneficial for a ferret and its nap routine, these animals tend to get easily bored so they’ll look for new sources of entertainment. You can let them wander freely around your house as long as you can supervise them. But, even so, you must first ferret-proof your home to avoid injuries and accidents. Make sure to cover all outlet sockets and hide power cords as ferrets love chewing and they can get injured or even die because of misplaced wires. Bear in mind that they also enjoy climbing and jumping, so you shouldn’t keep any valuable objects within a reachable distance. Store your valuables in closed cabinets and closets your pet won’t have access to. And, if you want to prevent any further damage done to your furniture or decorations, we recommend offering your pet some toys of its own. Anything made of foam or rubber will do as these materials are safe and won’t harm your ferret’s teeth or gums. However, you may have to replace them regularly because of your pet’s chewing habits. These animals are quite pretentious and, therefore, require a special diet. If they are overfed or lack enough physical activity, ferrets can easily get obese, which will lead to further complications and health problems. Ferrets are carnivorous animals and should consume premium commercial food that is specifically formulated for their needs. The food should be rich in proteins and fats to ensure an easy digestion. Also, avoid feeding your pet sugar, fruits, veggies, dairy products or foods high in carbs and fibers. Similar to rabbits and cats, ferrets are self-groomers and are quite clean. They shed around twice a year, so make sure to purchase special combing brushes to remove the loose fur and keep your house free of unwanted hair and allergens. Combing will also stimulate the growth of new fur and will make the existing one thicker, shinier, healthier, and stronger. Apart from this, ferrets also require monthly teeth brushing and regular nail trimming to prevent scratches and cuts. And, since they have a specific odor, washing them with special shampoos made for ferrets will help to tame their natural scent. A common misconception for people who don’t know much about ferrets is that, because they are small and live in cages, they are also low-maintenance. However, ferrets can suffer from a wide array of health affections, and each must be treated accordingly if you want your pet to live a long life. From ulcers to gastric problems and diseases of the pancreas, ferrets are prone to certain health problems. One common affection that determines some owners to give up their pets is the adrenal gland disease. 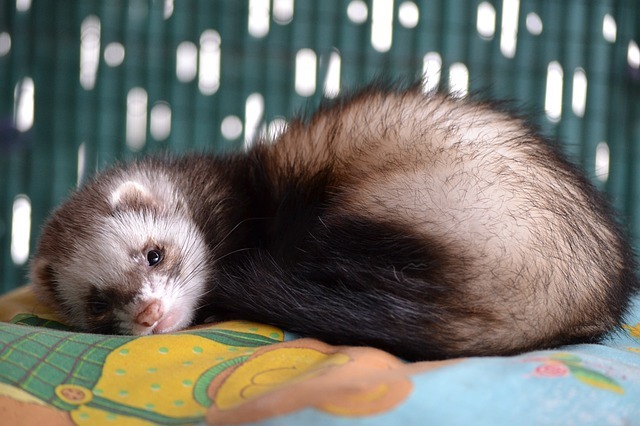 It occurs in adult ferrets over two years old and some of the symptoms include sudden loss of hair on the shoulders, hips, and tail. This affection is treated by surgery or with the help of hormone therapy. These small animals must be neutered to avoid certain health issues too. For instance, unneutered males are more aggressive and emit a certain odor that is stronger, while females can even die. This is the reason why you won’t find too many pet shops selling unneutered ferrets in the United States. Since it’s always better to prevent than to treat, there are several ways that can help your ferret live a long and happy life. Don’t forget to take your pet for its annual vaccinations against the canine distemper virus and rabies. Ferrets should also be examined for parasites and ear mites once a year. Toenails must be trimmed as often as required, and don’t forget to also take your pet for its annual dental checkup and cleaning. Most of these investigations can be conducted by veterinarians on the spot, so make sure to find one who is up for the job.